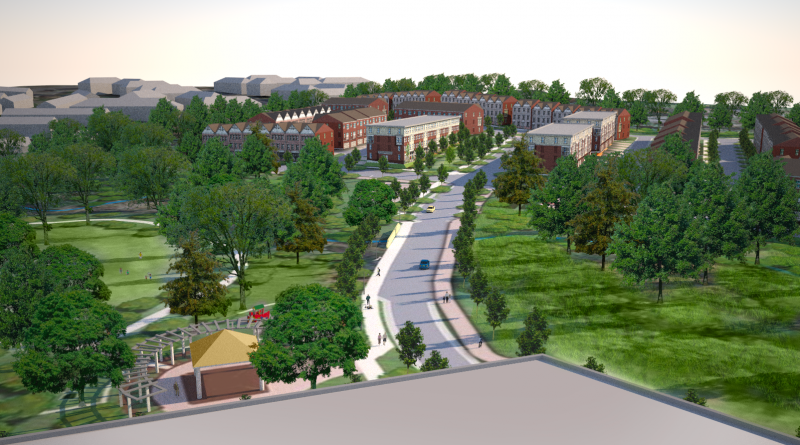 Plans to rezone 29 acres in Leesburg’s Crescent District to allow residential construction were given their first glance at last week’s Planning Commission meeting. The Crescent Parke application seeks approval for 198 townhouses, 96 stacked townhouses and 96 multifamily dwelling units. Nonresidential uses would include up to 110,550 square feet of office space, 137,175 square feet for retail, an area for a future hotel, and a 2,000-square-foot community room. The land stretches from the terminus of Gateway Drive to Davis Drive along the edge of the Leesburg Bypass. The assemblage also includes the Olde Izaak Walton Park, land currently leased by the town, but which the developers would donate. Town planner Michael Watkins pointed out to the commissioners that there is no money currently being provided for any improvements at the park. The park contribution would happen after the development gets started, but town staff is recommending that it be provided up front. The land is currently zoned for commercial and mixed use development, but, if approved, the application would rezone the property to allow for high-density residential use. It would also rezone two acres of open space for residential use. While it was the first time the rezoning was before the commission, the applicant had previously—and narrowly—won a Town Council vote for a Town Plan amendment to allow residential development in the area. The commission had recommended denial to the council. Christine Gleckner, a planner with Walsh Colucci representing the applicant, said she believed “significant strides” had been made since the Town Plan amendment was before the council in the fall. As examples, she noted that the applicant had reduced its proposed residential density by 6 percent; increased open space by 7 percent; and the overall plan envisioned 42 percent open space if the contribution of Olde Izaak Walton Park is considered. The applicant also would contribute $3.4 million to county schools as well as contributing money for offsite transportation improvements and fire and rescue. Two residents spoke at the commission’s Jan. 21 public hearing. Jim Sisley, a commercial Realtor and past chairman of the town’s Economic Development Commission, said he continues to see high vacancy rates for office and retail in the town. He urged the commission to consider the merits of the added residential development. Twenty-seven-year town resident Gem Bingol, on the other hand, advised caution. The commission agreed to continue its review of the application during its Feb. 4 work session.